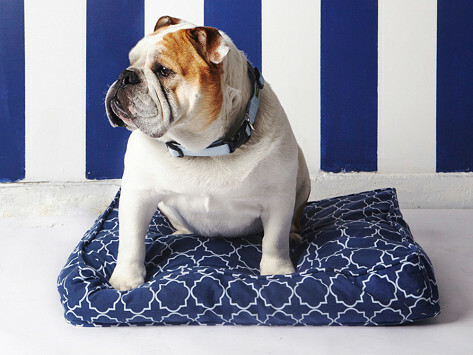 This dog bed cover is more than cozy—it gives your pup the comforting scent of you. Fill the mesh stuff sack with your no-longer-needed clothes or linens and top with the washable canvas cover. Now your pup has a cozy spot to rest that feels, and smells, like home. 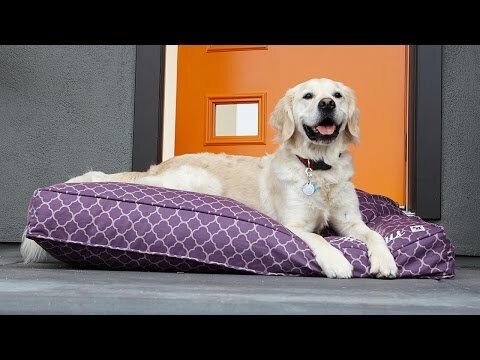 Or, if your dog is already attached to his bed, this machine-washable, water-resistant canvas cover fits over that, too. Dimensions: Small Square: 22" x 27" x 5"; Medium/Large Square: 27" x 36" x 5"; Extra Large Square: 36" x 45" x 5"; Round: 36"D x 5"; Extra Small Square: 20" x 5"; Extra Small Round: 20" x 5"
My dogs LOVE this bed! My dogs LOVE this bed! Easy to clean and beautiful to look at! Her solution saves beds and gives unwanted clothing a new life. Now it’s easy to have a clean place for dogs to curl up—with a scented reminder of their favorite human built in.